There’s the amazing shortstop who excels at what he does. But he keeps bugging the coach: He wants to pitch. He gets the chance and tanks. 11 runs come in quickly, bases loaded, zero outs, still in the 1st inning. The coach takes the blame because he put him in the wrong place. His strength was shortstop. But he wanted to be pitcher. I think we all have strengths to use for the common good. When we identify and use our strengths—those abilities, talents and gifts—that God has implanted in our D.N.A., we find our lives more fulfilling. We are, in effect, living our design. I write from a Christian perspective, so here’s how I think of it: Your strengths are clues to what God will do through only you. For some people they’re obvious. Like my brother Deric Ruttan. He’s a country music singer and songwriter. It’s been a great year for him. He was nominated for a Grammy for a #1 song he co-wrote for Blake Shelton called “Mine would be you.” That’s just one of his many accomplishments. Hilarious. And I think he’s being humble; he has other strengths. But they’re not as strong: he’ll be the first to tell you he was never at the top of his math class or captain of the hockey team. But music? Make no mistake about it: Deric’s strengths are evident. But what about those who are not sure what they’re strengths are? 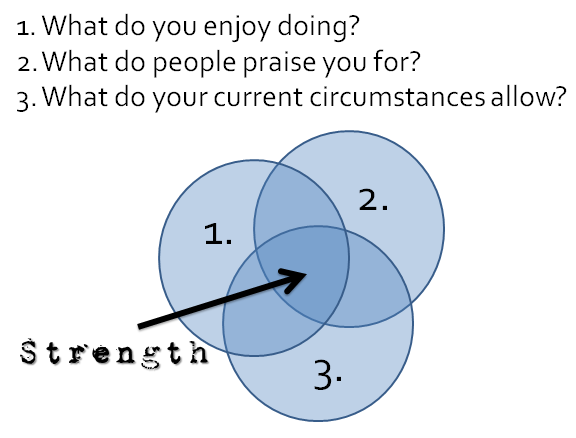 The things we enjoy doing are often clues, pointing us to strengths. If you think the things you enjoy can’t be connected to your wider purpose, then perhaps you need to stop the self-flagellation. 2. What do people praise you for? What do others acknowledge in you? Do people ever come up and say, ‘Hey, you really do such-and-such well.’ Pay attention to that. 3. What do your current circumstances allow? Do you have the time, energy and means to do what’s listed in #1 and #2? Then chances are, you’ve been given an insight into a strength that you need to use at this point in your life. Go through the list and see what those things are for you. Imagine each question as one of three over-lapping circles (see diagram). Where they converge is the strength. Maybe it will emerge or evolve. Sure. But for now—maybe that’s it. I think its our responsibility to share our strengths. Someone gives you a light to shine in a blackout. Do you put it under a wet blanket? No. You use it for the common good. It’s part of what we were made for. We can spend our whole lives, as Kennon Callahan says, focusing not on the strengths we have, but on the strengths we wish we had. It’s an injustice to pass over the tools you’ve already been given. You don’t have to be Martin Luther King Jr, or Mother Teresa, or Albert Schweitzer. But you do have gifts that can impact this world for good. Sometimes we need a miracle, yes. But sometimes all the world needs is you. When you surpass dwelling on your weaknesses, and identify and use your strengths, you feel God’s pleasure. That’s living your design. 2. What do others praise you for? Your strengths are clues to what God will do through only you. Next Post: What If Our Actions Gave The Angels Courage?